Cream butter or margarine until soft. Beat in eggs and sugar until light and fluffy. Stir in cake meal, nuts, salt and lemon rind. 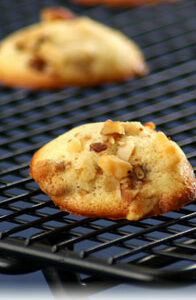 Drop by teaspoonful onto well-greased cookie sheets, at least 2 inches apart, to allow for spreading. Bake in a moderate oven (375 degrees F) for 10 minutes or until browned at edges.